What must you learn for the CNA exam? Well, you will need both knowledge and practical skills to function effectively as a CNA. A Certified Nursing Assistant may choose to work in a nursing home, rehabilitation centers, hospitals, adult day care facilities, long-term care services, hospice, or in home care. What is taught in a CNA Exam CLASS? These are the things you will learn and be tested in a CNA exam class because these are the skills you will need to perform on a daily basis when you have a job functioning as a Certified Nursing Assistant. The CNA certification exam is also called the nurse aide assessment examination or the National Nurse Aide Assessment Program (NNAAP). 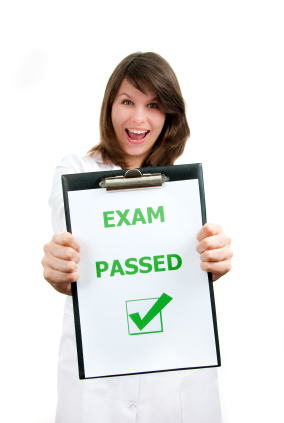 This CNA exam is the final test a nurse aide student must pass in order to attain eligibility for employment and be listed on the Nurse Aide Registry of a specific state. The CNA exam is designed to evaluate the knowledge, skills and abilities that are necessary to safely perform the job of a nursing assistant. The exam is a two part test. It has both a written or oral exam and a hands-on skills examination. A nurse aide candidate must pass both the written and the skills evaluation to qualify to obtain a state nurse aide certification and to be eligible for any entry-level nurse aide position. The National Council of State Boards of Nursing is responsible for developing a CNA evaluation program which takes into consideration both federal and state regulations. Once certified you have the legal right to obtain employment as a CNA. This can mean a home health care worker, orderly, nurses’ assistant or other worker that serves as the front line and works very closely with patients. Becoming a CNA is a very rewarding career and enables you to achieve secure employment where you have the satisfaction of knowing that you are making a positive impact on people’s lives.